My wife is accustomed to my working on weekends, but I think I set a new precedence by combining an Indie Alaska shoot while also celebrating our 1-year wedding anniversary (! ), while also shooting photos for a band (!! ), while also pre-producing another future episode (!!!). 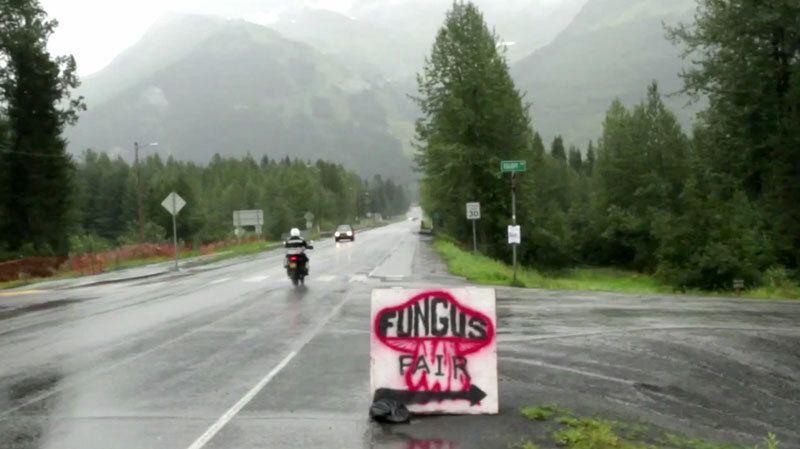 The way it happened was like this: on a Saturday morning Travis Gilmour and I drove out to Girdwood to meet with mushroom expert Kate Mohatt. 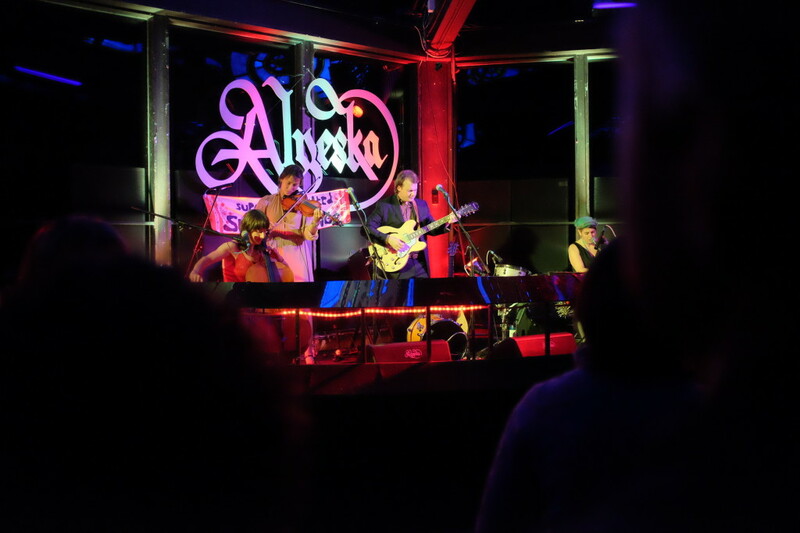 While we usually stay away from the more newsy stories for Indie Alaska episodes, this year for some reason mushrooming is really big in Alaska, and we just couldn’t kick our curiosity. Kate Mohatt was featured in this Anchorage Daily News article by Julia O’Malley – http://www.adn.com/2013/08/18/3031314/secrets-of-the-fungi-forest.html – so we contacted Kate for a shoot on the weekend of the Girdwood Fungus Fair. 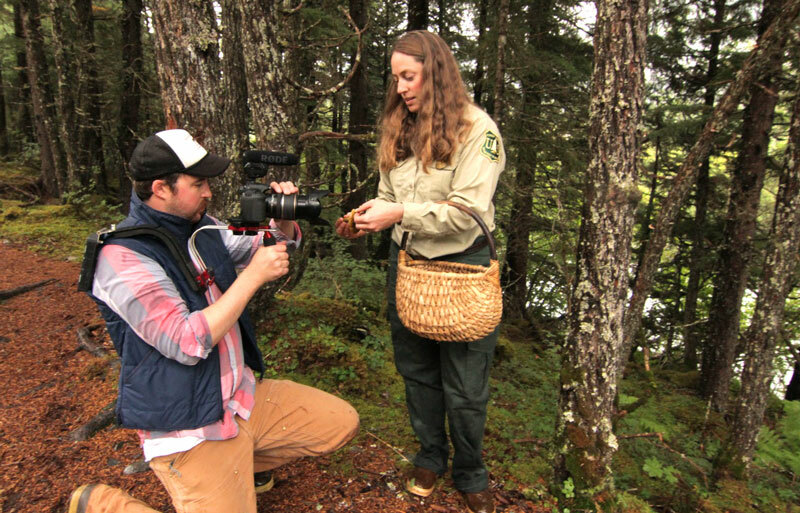 While Travis set up the interview with Kate (against a window, which actually turned out nice with only one LED light), I went out with another forest ranger to shoot B-roll of mushrooms and crowds on a foray. It was humid and rainy, so I had to leave all my car windows open while driving around – to prevent the camera lens from fogging up – which made sure everything in my car got nice and soaked. After dropping off the ranger at the Fungus Fair headquarters, I was then supposed to meet a big group of hunters at the Hand Tram parking lot. But… I mistakenly went to the other Hand Tram parking lot, the one on the opposite side of the trail. After about 10 minutes of waiting for a big group of mushroom hunters to show up, my phone rang, and Travis had finished the interview and was ready to get picked up and go shoot more B-roll with Kate at her secret spot. So yeah, at this point the story was no longer going to be about big groups of enthusiastic mushroom hunters crowding the trampled patches. Sometimes that’s the way it works – the story is dependent on the visuals you have to match the interview narration. Which was okay by me, because I really wanted to focus more on the mushrooms anyway. 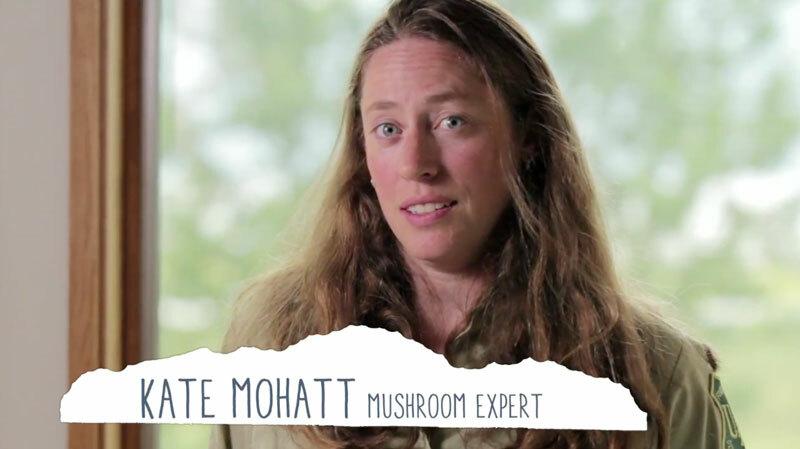 At her favorite spot, Kate showed us a bunch of different mushrooms, while explaining their Latin names and significance. But honestly, it’s hard to pay full attention to those kinds of things when you’re focused on operating the camera and getting a good shot. So at one point, it wasn’t until after I swallowed an edible mushroom that I heard Kate remind me to “chew it up and spit it out, to avoid getting sick.” Oops. 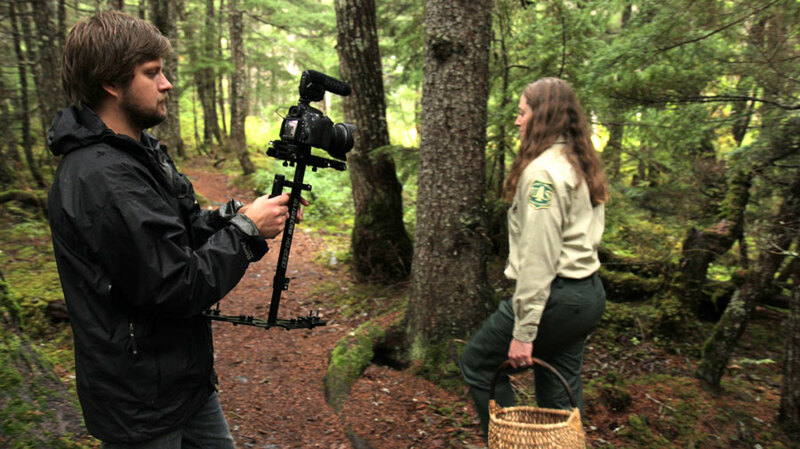 The best part of this shoot was finally getting a chance to try out our Glidecam steadicam. This was the perfect opportunity, and we spent some time earlier in the week practicing to balance it. All of that goes out the window when you’re on the shoot and have no time for little adjustments, so little things like figuring out how to use a wrist strap was no longer priority. And man, did my wrist hurt after this. For a few days actually. But my wrist didn’t hurt as much as my ego – when, while walking backwards in front of Kate, I accidentally stepped off a wooden bridge and fell into a deep puddle. Real professional. 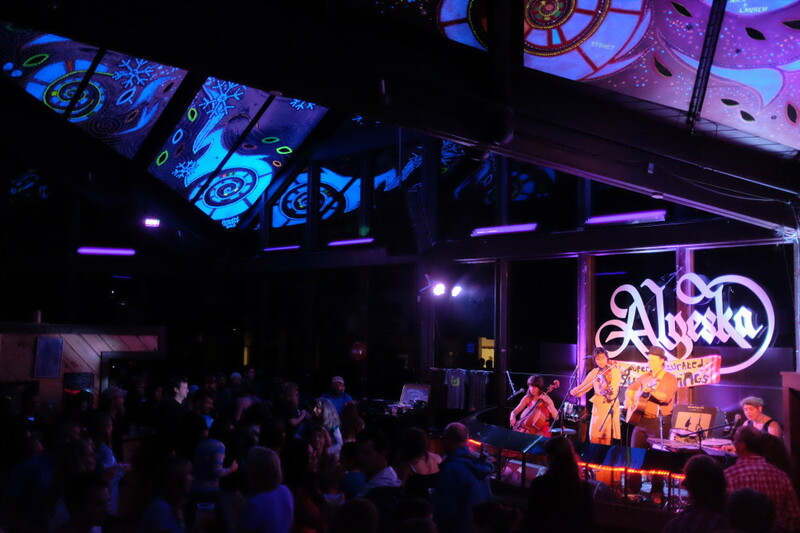 Anyway after all this, my wife met us at the Sitzmark for some lunch, Travis drove himself home, and my wife and I celebrated our one-year anniversary in beautiful Girdwood with a live performance by one of our favorite bands, Super Saturated Sugar Strings. Since I already had my stills camera, I couldn’t help shooting some photos for the band during their set. Of course using some of the shot framing principles I’ve learned while shooting video, like using a blurry foreground to bring attention to the subjects. And after all that, we met some really nice people, shared a bottle of wine with them, and worked on pre-producing a future Indie Alaska episode with one of them. Isn’t it great when life and work can come together in a long day of productivity? Or maybe it was that mushroom I wasn’t supposed to swallow….